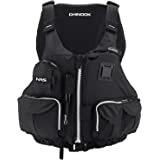 This vest has multiple straps to manipulate in order to change the fit and after some fine tuning, fits perfect. 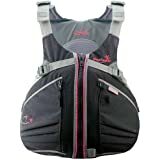 Fits great had if for over a year no problems and very well made. Love all the pockets, fits good, comfortable. High-back flotation rides above back rest. Neoprene padded shoulders and lower back waistband and open sides for ventilation. Hand wash soap and water. 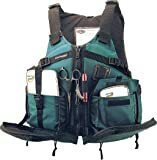 This is the best life jacket I've ever owned. 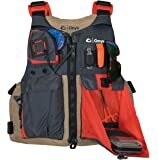 I served in the Army as a combat medic, so I'm accustomed to having lots of gear and tools on my chest for easy access, and that's exactly what I wanted out of a life jacket that I intend to use for multi-day kayak-fishing trips. The pockets look bulky in the pictures, but they're actually low profile. I have no problems at all casting with two hands to either side of me, or while working the line (as other reviewers have complained about), so I think it's a question of getting the size that fits you and adjusting the straps properly. I'm 180 lbs at 6'1" and got the small/medium. 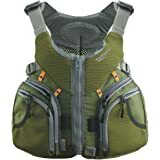 This jacket has three straps on either side at various angles plus the two shoulder straps to adjust the fit on you (eight in total, if you weren't counting), so if you're used to adjusting body armor straps for the perfect fit, this life jacket will be very familiar and easy to set up. 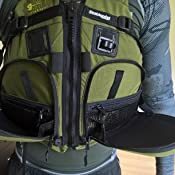 If the pockets are getting in your way, try lowering the shoulder straps and tightening the side straps that come up at a 45-degree angle to pull it in tighter around your chest without compromising breathing. 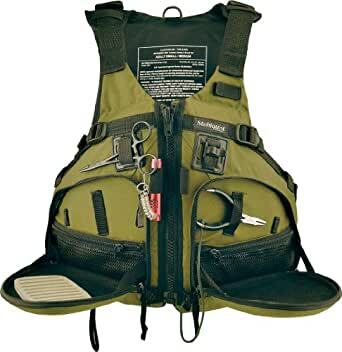 Keep in mind this is a type III PFD, so it's not the safest choice if you're potentially going to be overboard for prolonged periods of time, or if you're in situations where you could be knocked unconscious when you go overboard, since it's not guaranteed or designed to keep your head above the water in all conditions. 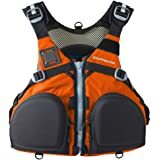 Great product, I have to admit I am not the strongest swimmer, this has saved my life when my boat flipped into the cold Alaskan water and I am 5 foot 6 and I weigh nearly 200 lbs, luckily I was able to keep myself afloat and get to shore. I would first of all like to thank the company because their product saved my life and it's also a great product for what it is. Besides that fact, the pockets are easily accessible and large enough to keep a small fly box on ya and it has a great little compartment to fit my aluminum pliers and the back of the pocket cover can be used as little tables if your tying something up that is intricate. Some people have said that it bothers you when you cast but it hasn't been for me because if you adjust it right you wont cause rubbing. 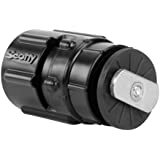 All in all, I would definitely recommend this product to all fly fisherman or any fisherman in general, I would recommend similar products offered by the company too. Pockets are big enough to hold a fly box and tools as well as stash my Colorado kind. My husband ordered this vest in a size S/M he usually wears an XL shirt he is 6'1" 190lbs and it fits PERFECTLY! Defiantly measure the size around your pecks! (as chest frames very in this height and weight range) He was on the line between top number of S/M & bottom number Large/XL and was worried if he would even be able to cinch the straps or if they would be fully extended on the S/M but also (as you should) prefer a snug fit over having to tighten the straps fully on the L/XL. SO he went with the S/M, when it arrived he opened all the straps and was able to pull them in to fit his frame. If you are on the boarder line like he was I would recommend the S/M. 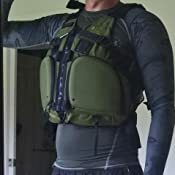 Because unlike your shirts, that you want to fit with more breathing room, if you expect this to help you float, you don't want it to slip off. 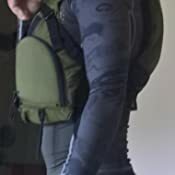 Excellent vest, see youtube videos if still on the fence, because it sold us also photo from guy below, he is the same build and also recommends s/m, we are so happy we took his/ you tubes advice He loves it! 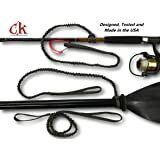 Looks great and we would definitely recommend it for any kayak angler! 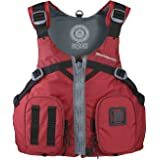 This is the perfect fishing vest for kayaking, it is well made and designed and does a great job as a floatation device. 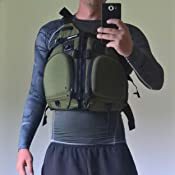 I bought this for my sixteen-year-old Grandson because I knew that if he was going to have to wear something while fishing from his new kayak it would have to be something both functional and that would not hurt his manly self-image. He not only put this vest on, but he was proud to do so. 5.0 out of 5 starsBig guy, little gun, lots of adjustments! I’m 6’1” and 260 this fits me like a glove. It’s cooler than my others and less restraining. Very comfortable sitting in my Ride 115 kayak seat. The pockets are large and easy to assess, I can put my iPhone in one and my 38 snubnose revolver in the other (I have snake issue.). I have a 38” waist and and big shoulder and this vest fits very well. 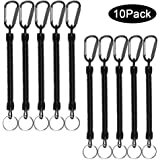 Has many adjustment straps. I can swim in it easy. 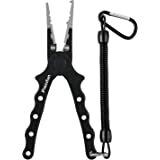 Bought this for kayak fishing. I love it! I’m a big man (6’ 4” and 265 lbs. / 48” chest) and it adjusts and fits great. Doesn’t interfere with my seat back on the kayak, and the storage for tackle and gear is just right.